Days started early – can you tell I’m barely awake! 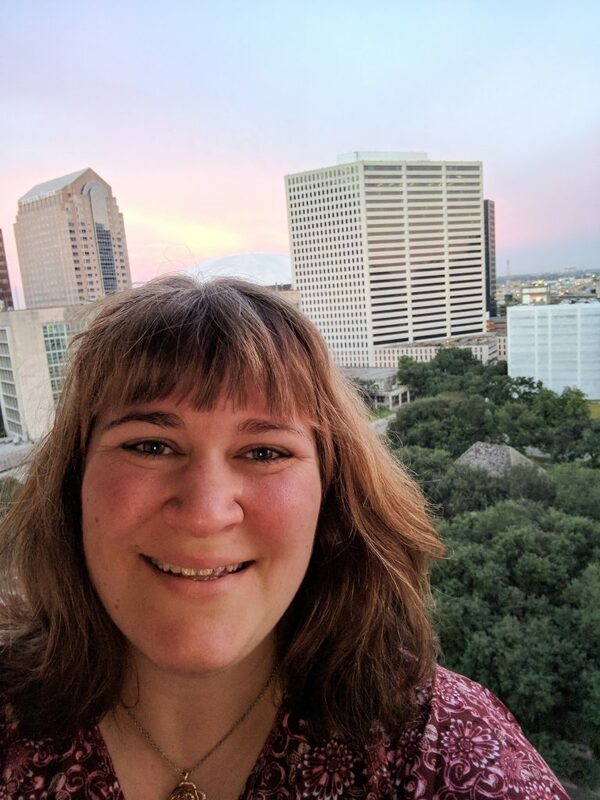 I grabbed this selfie at sunrise off my hotel balcony with the super dome in the background. What you can’t see is my high quality Altra running shoes hard at work to get me through miles and miles of walking! They did a rock star job and I’m happy to say my feet are still attached. My goal when I hit the conference floor was to learn all I could about produce as an industry and bring a best of list back to you. So here you have it – the very best of more than 1,000 vendors and the items I think are worth seeking out/asking for at your local grocery! 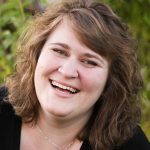 Fresh Summit is all about trend spotting. Everywhere you go produce marketers are setting new trends for how our food gets to market and is presented to us. 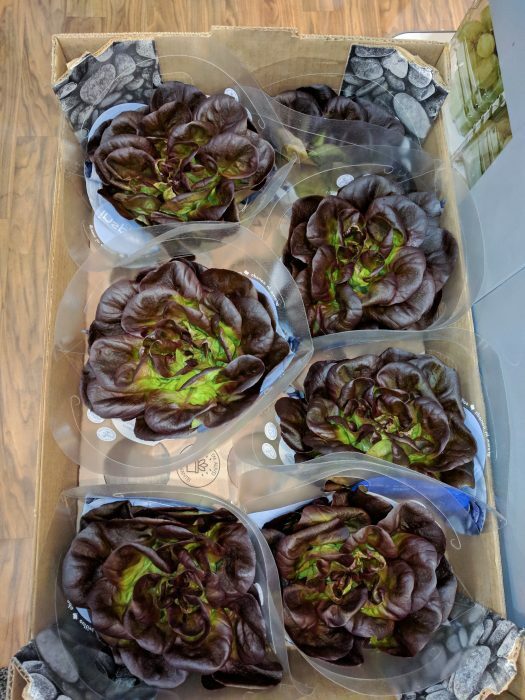 One of the fun new trends in packaging is lettuce wrapped like a bouquet! The presentation is appealing and beautiful. In fact it is so pretty I could see it showing up in a bridal bouquet. 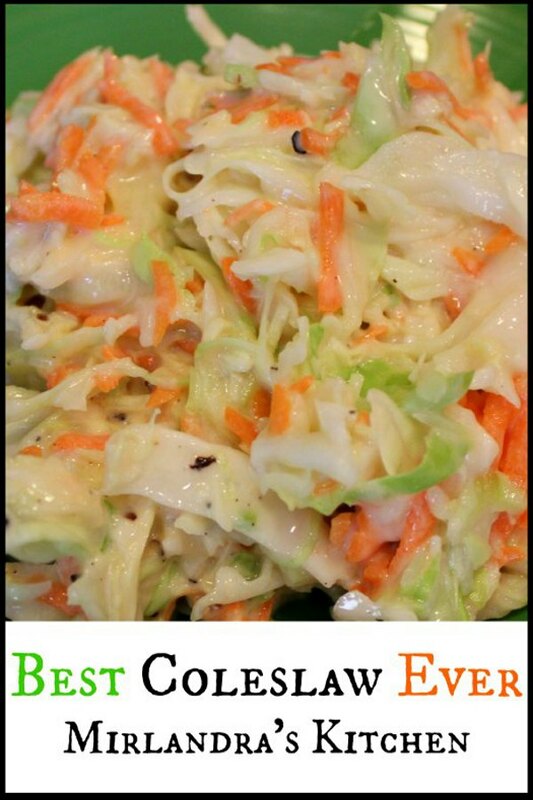 I think this is a great way to get us all eating more healthy greens. 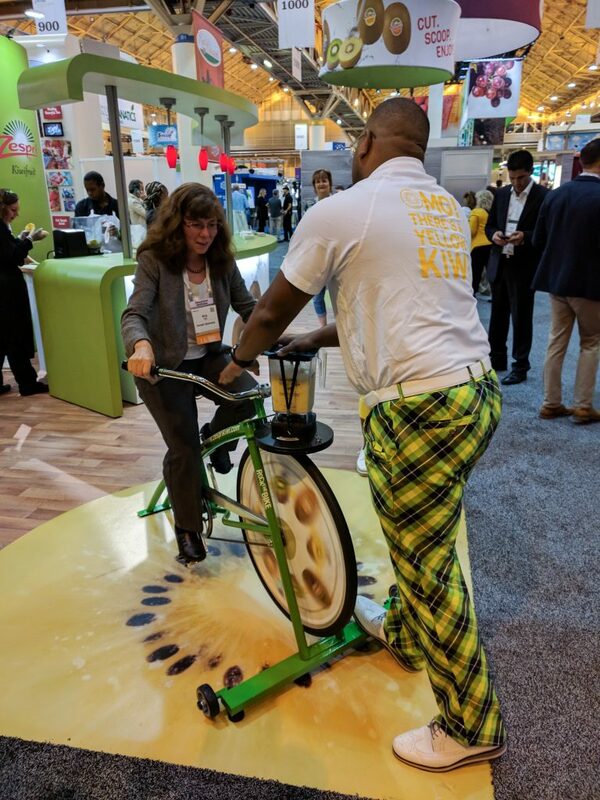 PMA is all about the chance to try new fruits and veggies you have never encountered before. Hurst Berry Farm is located about 45 minutes from where I was born and raised but I had never heard of them or their amazing kiwi berries! These cute, brown grape sized kiwi are extra sweet and juicy. You pop them like grapes, skin and all. Or you can dip them in chocolate which is Sooooo good! The one heartbreaking thing about this fruit is that it has a very short season – just a few weeks wrapping up in early November. You can order online from Hurst but they are also in grocery stores all over the country. This is one of my must try recommendations after PMA! I was so impressed I have been sharing the berries I brought back with strangers to spread the word! At this point I’m willing to guess many of you have seen options for year round indoor gardening. Lots of companies do little machines you can use for herbs etc. This new vertical aeroponic growing system from Indoor Farms America is a similar concept but on steroids! 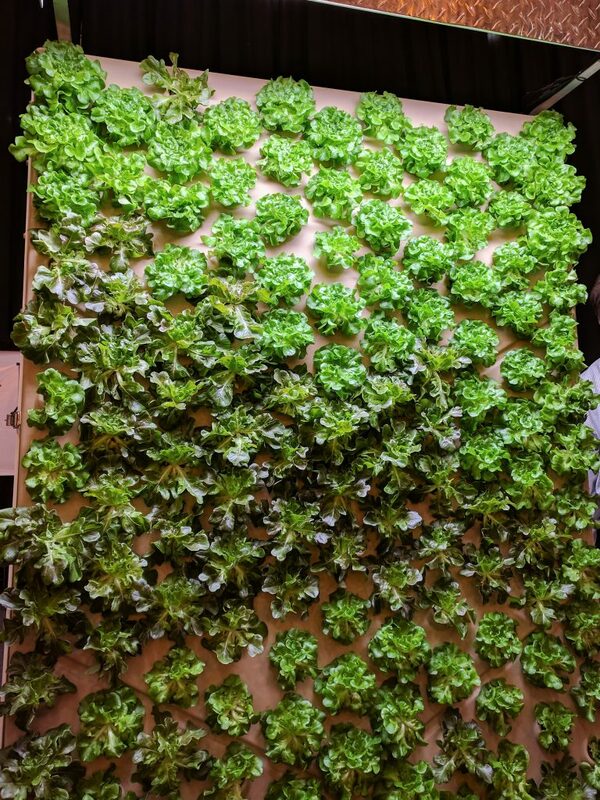 I got to sample some lettuce right off this wall which is taller than I am and visit with their chef. For total range of produce I was excited about what Melissa’s had to offer. 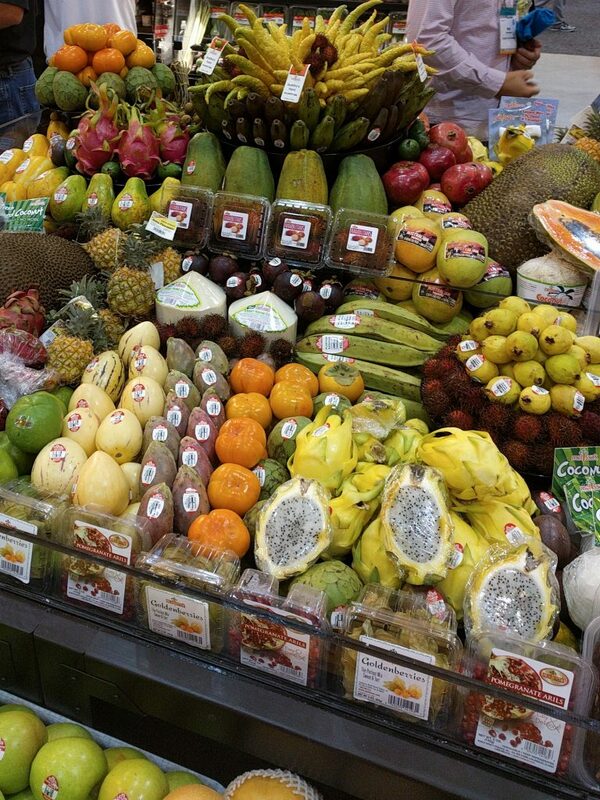 They had so many unique fruits and veggies I had never seen or never tried. The Dragonfruit was delicious (pick one up SOON) and the same with the Goldenberries. Melissa’s is also bringing out pre-soaked lentils and other ingredients to simplify dinner prep. Keep your eyes peeled for their label and check out their unique offerings whenever you have the chance! 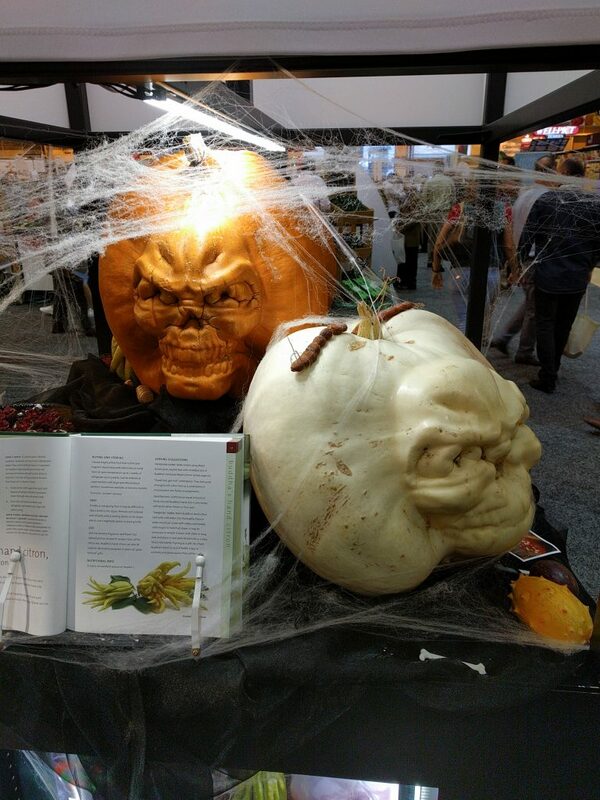 They also brought these hilarious pumpkins to the show! When the pumpkins were growing in the field they forced each fruit to grow into the shape of a mold and then popped the mold off! I thought it was a wonderfully fun take on pumpkin growing! I tried a lot of great snacks at PMA but one of my favorites was this treat from Nature’s Intent. Strawberries are semi-dried and then thickly coated in dark chocolate. It tastes amazing and I was hard pressed not to horde the bag for myself! 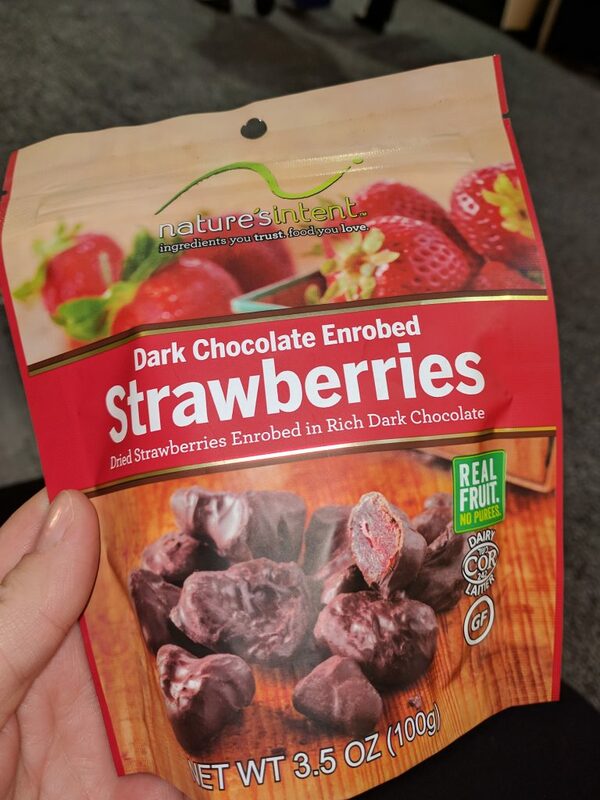 I love the chew of the partially dried strawberry combined with the sweet burst of fresh flavor and the rich chocolate. One of the first booths I stopped at was the Sun World grape booth. I love grapes and was curious about the Adora grapes they were sampling. They were excellent and while I don’t really like green grapes I thought to be fair I should try theirs. Simply put, I’m now a green grape fanatic but only when it comes to AutumnCrisp grapes. 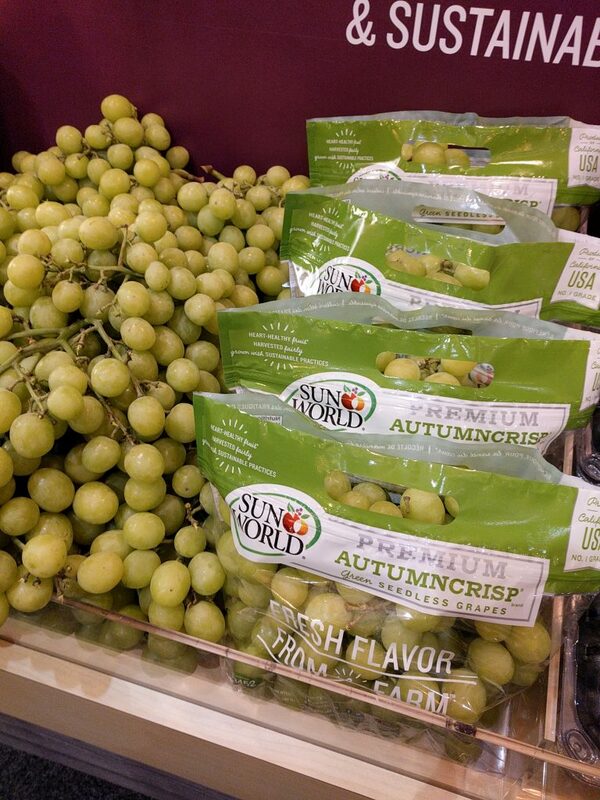 This is a proprietary variety of grape that only Sun World grows. I’ve seen it at Costco since I’ve been back but be sure to ask your local grocer if they have any. The flavor is rich and sweet with a hit of muscat. The grapes are large and firm and crisp with tons of juice. I was so excited about these grapes I ran around the conference trying every other kind of grape that was available. At the end of the day these were still my favorites. One thing I learned at PMA was to figure out what variety of produce you love and what brand grows it. Keep your eyes peeled for their label and grab them when you can! Are you on the succulent band wagon yet? 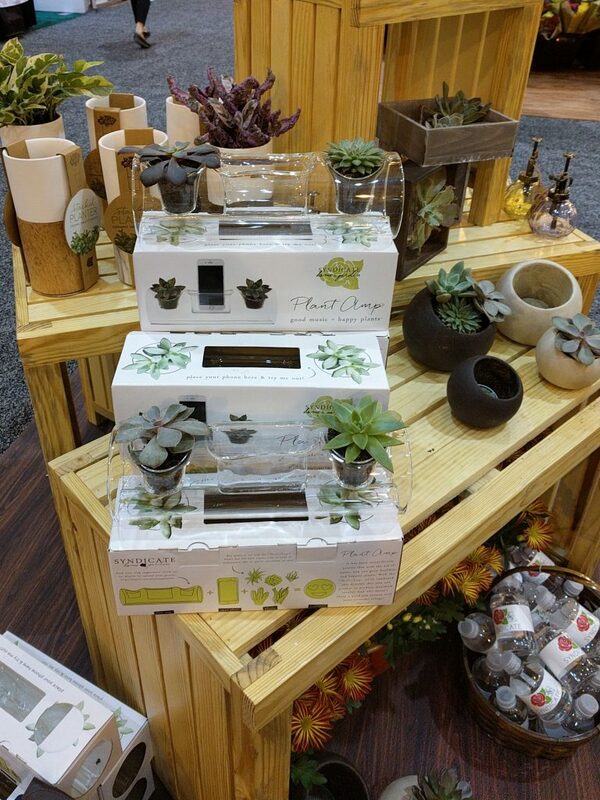 I was not but this Plant Amp from Syndicate Home and Garden converted me. They sent me home with one and I’ve been loving it! The design is sleek and elegant but it is still functional and practical. By the way… I don’t recommend putting succulents in your luggage. A little dirt goes a long ways! At PMA there is opportunity for learning and growth around every corner. Zespri Kiwi participated in the recipe development contest I judged and made a fun fruit sushi. The main dish was lovely but they served it with a kiwi sauce that was amazing! Everybody brought their best ideas to PMA. Over and over again I got to see old ingredients used in exciting new ways. 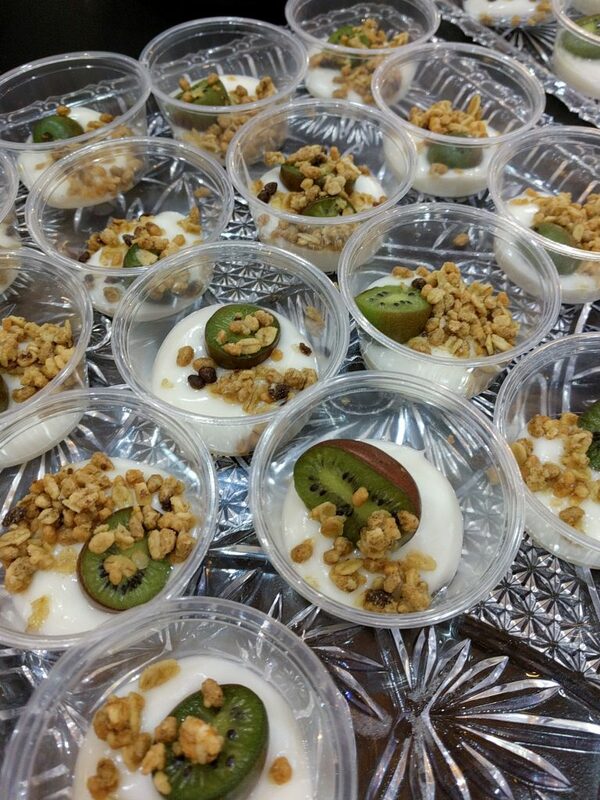 After trying Zespri’s contest entry I’m newly inspired to use kiwi more in desserts and meat dishes! I don’t cook with it nearly enough. I also highly recommend their SunGold variety of kiwi. It is sweet and mild with lots of kiwi flavor. It is also less hairy than traditional kiwi – practically hairless in fact. My last find is a bit hidden in this assortment of gifts I was sent home with! 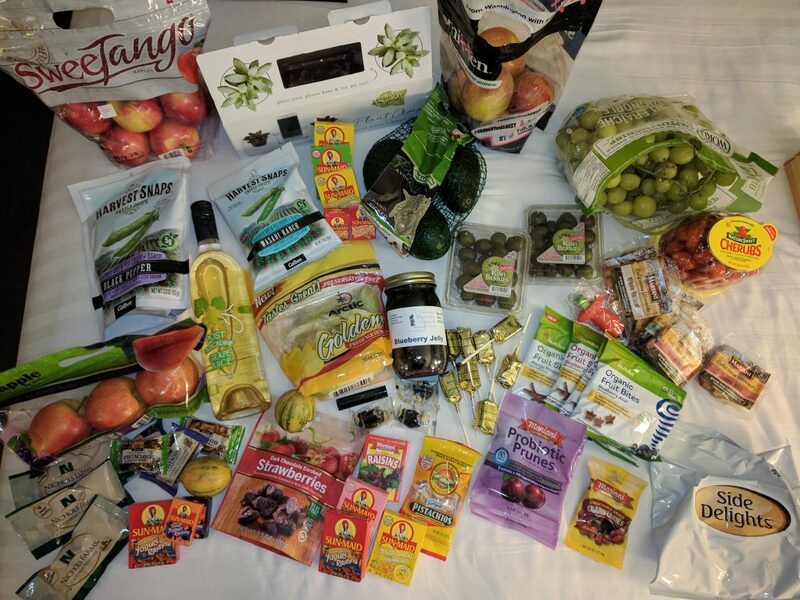 (Yes I ended up over the luggage weight limit and most of this went home in my backpack.) The conference was closing on Saturday and I was headed out for the weekend when I walked by a wine and juice booth. I had heard about Muscadine wine but never gotten to sample any. What I ended up sampling was the Post Muscadine Grape Juice from the Post Familie Vinyards. I’ve never had grape juice like that! If I’m ever in Arkansas these guys are my first stop! They carry four varieties and I would love about a case of each. I also need to try the wine now of course. If you don’t live in that area they do allow orders online. When I first agreed to go cover PMA I was excited but not sure if the experience would live up to my expectations or be worth it. However, it blew my expectations away and I loved it so much I hope to go again next year!